HepG2 lysate (25 μl) was loaded onto a Criterion TGX Stain-Free Precast Gel (lanes 2 - 5), run under reducing conditions and proteins were transferred onto a nitrocellulose membrane. Bio-Rad Precision Plus Protein Prestained Standards were run in lane 1. Human anti AKT1 (HCA308) was used to detect AKT1 (approximate MW of 65 kDa) in lanes 2 - 5. HRP-conjugated Human anti Bacterial Alkaline Phosphatase (HCA275P) was used as a secondary antibody at a dilution of 1/1000. The blot was visualized with the ChemiDoc MP Imaging System. 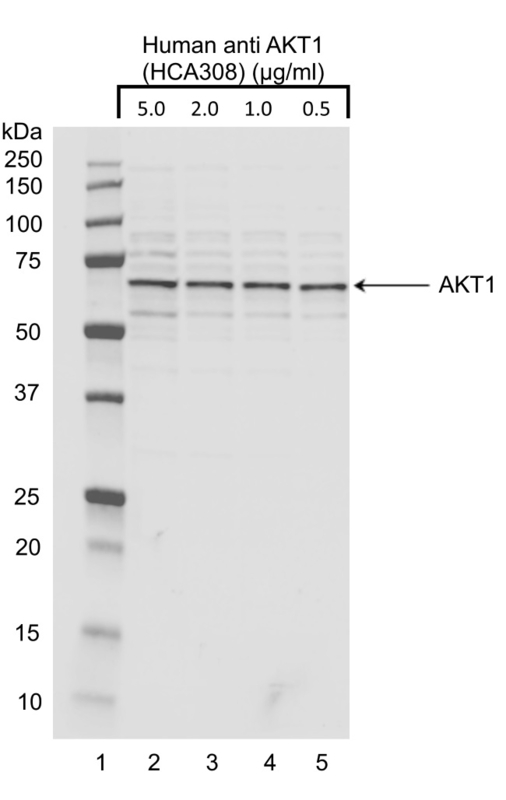 Human anti AKT1 antibody, clone AbD30769 recognizes AKT1, also known as RAC-alpha serine/threonine-protein kinase, protein kinase B alpha or Proto-oncogene c-Akt. It belongs to the AGC kinase family (Brown and Banerji 2017). AKT activity is regulated downstream of receptor tyrosine kinases (RTKs) (Franke et al. 1995, Brown and Banerji 2017). Its substrates have a consensus phosphorylation motif: R-X-R-X-X-S/T-B (X is any amino acid and B denotes a preference for bulky hydrophobic residues) (Brown and Banerji 2017). A number of AKT substrates have been described including BAD (BCL2 associated agonist of cell death), FOXO (Forkhead Box), MDM2 (MDM2 oncogene), TSC2 (tuberous sclerosis 2), PRAS40 (proline rich Akt substrate), CDKN (cyclin-dependent kinase inhibitor) and GSK3β (glycogen synthase kinase beta) (Manning and Cantley 2007). AKT is frequently activated in cancer (Manning and Toker 2017). In breast cancer, AKT isoforms play different roles during breast cancer progression (Riggio et al. 2017). A bivalent human recombinant Fab selected from the HuCAL® phage display library, expressed in E. coli. This Fab fragment is dimerized via an inactive variant of the bacterial alkaline phosphatase (BAP) fusion protein. The antibody is tagged with DYKDDDDK and His (HHHHHH) tags.